Michael Dove, 27, of Gipsy Lane, Old Whittington, Chesterfield, has been jailed for 16 months after pleading guilty to assault and causing grievous bodily harm. A violent boyfriend who hit his partner with a glass ashtray and attacked her in the street has been jailed for 16 months. 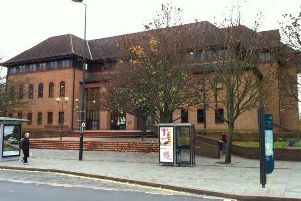 Chesterfield magistrates’ court originally heard in February how Michael Dove, 27, of Gipsy Lane, Old Whittington, Chesterfield, broke his partner’s arm during the ashtray attack and tried to push her into a wall during a subsequent assault. Prosecuting solicitor Sarah Haslam said police launched an overall investigation into both assaults after they initially received a call regarding the second attack when Dove’s partner had been assaulted by the defendant at Boythorpe Road, near the Whitecotes public house. Miss Haslam said the couple had gone out and the defendant had grabbed the complainant, pushed her and tried to push her into a wall several times and he had grabbed her around the throat. The court heard that people were gathered around the complainant who was on the ground and the defendant was nearby. Miss Haslam added that the complainant had explained she had been in a relationship with Dove since May and she had got her own property and this had altered his attitude. Dove told police he had been drunk and remembered pulling the complainant’s hair. Following Dove’s arrest for this assault on Christmas Day, last year, he was also arrested and charged for a previous attack on his girlfriend involving an ashtray from October 30, last year. The court heard how Dove had tried to hit his girlfriend over the head with the glass ashtray in October and had struck her arm and she suffered a fracture. The complainant told people at the time she had slipped, according to Ms Haslam, but after the second assault she told the full details. Dove pleaded guilty to the assault and to inflicting grievous bodily harm. Defence solicitor Amy Hobson told Chesterfield magistrates’ court that Dove who has alcohol problems made full and frank admissions. Magistrates committed the case to Derby Crown Court for sentencing on March 18 and Dove was handed a 16 month custodial sentence with a two-year restraining order.